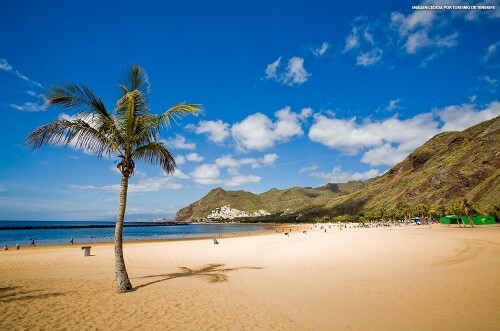 Cheap flights to Canary Islands: Tenerife & Lanzarote from Germany for only €59! UPDATE 30.1.: cheap last minute flights from Munich to Lanzarote in Canary Islands now available for only €58! Fixed dates 1.-8.2., book here, check screenshot. 6 kg cabin luggage included, check-in luggage and meal onboard available for total price €97. Ryanair now offers really cheap flights to amazing Tenerife from Germany. 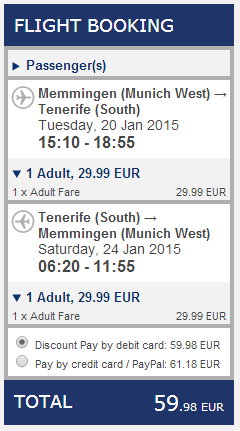 Return flights from Munich Memmingen, Cologne or Bremen to Tenerife South are available for only €59.98! Travel dates are in January which is great month to visit the island – temperatures are around 22°C. You can travel also in February which is even warmer for slightly higher price. 10 kg cabin luggage is included together with one other smaller bag. « WOW! Cheap flights to Hawaii: Honolulu for €549!